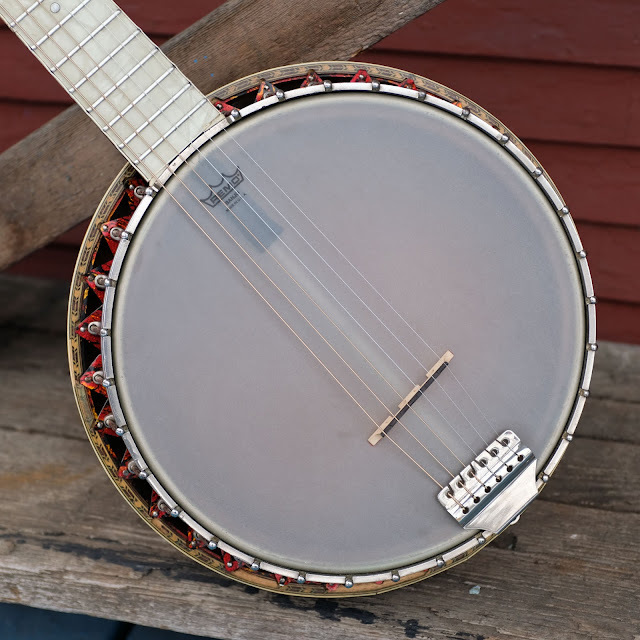 This celluloid-covered, gussied-up banjo-guitar is truly a mongrel of an instrument. 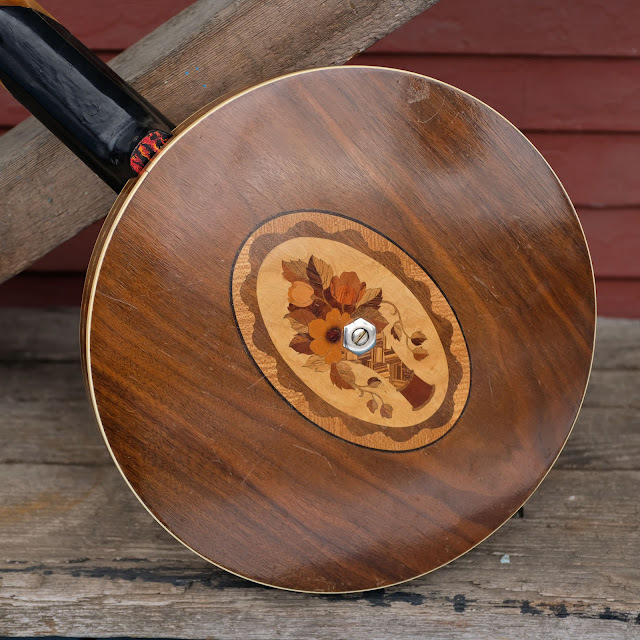 The neck is cut from a 1920s Stromberg-Voisinet (Kay) parlor guitar and then mated to a block of wood that allows it to be fit to a giant, same-period 11 7/8" rim with a "Little Wonder"-type tonering. 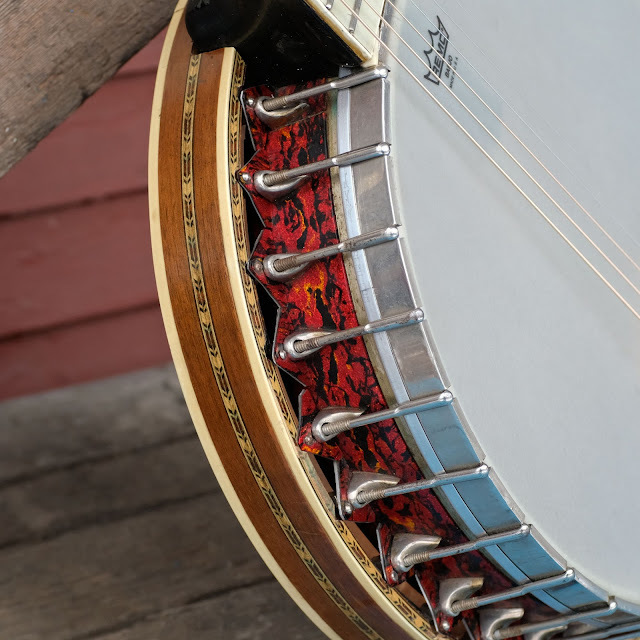 I'm pretty sure the rim, resonator, rim hardware, and tailpiece are original to one another but I'm not entirely sure what they came off. 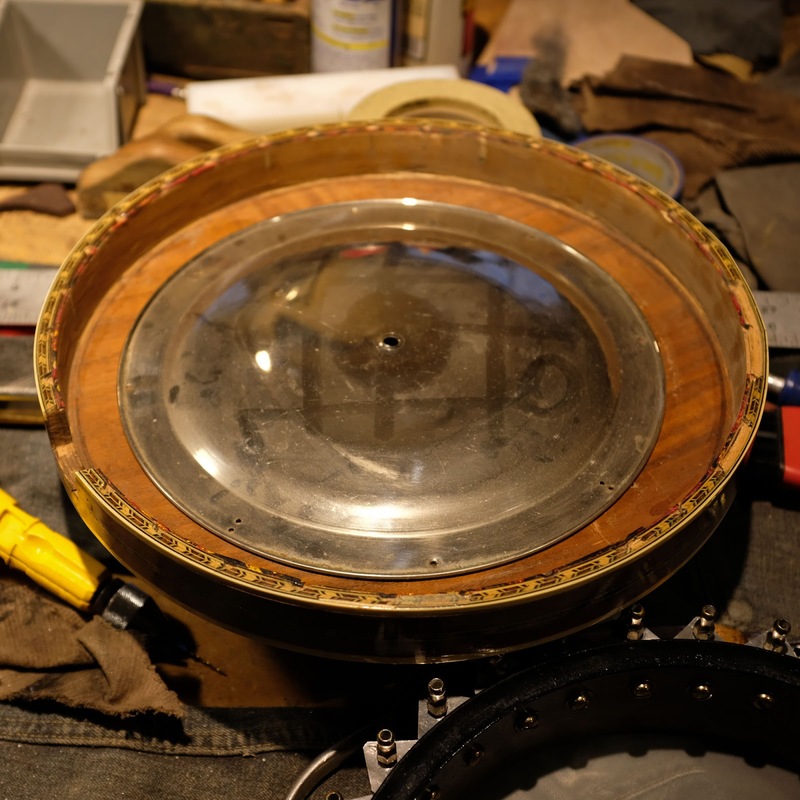 The inlay and design style of the resonator corresponds to both SV/Kay and Harmony products from that time, but I'm thinking it's a Harmony rim. 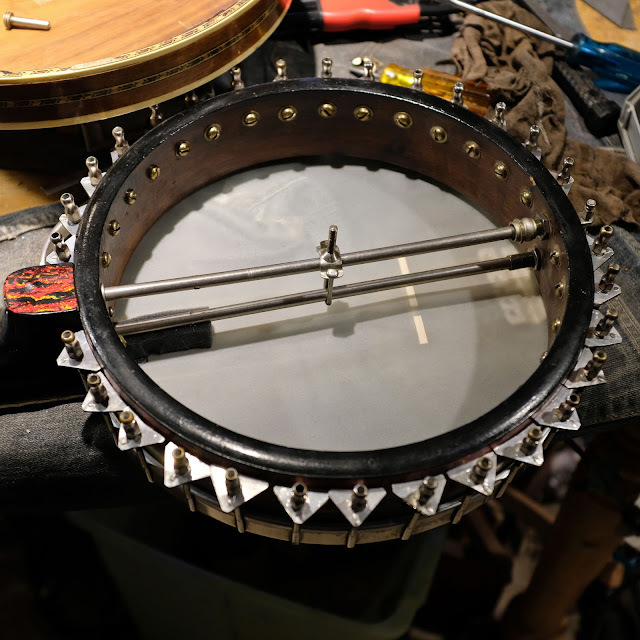 To muddy-up-the-waters further, there's a non-original double-coordinator-rod system installed, individual "flange" pieces were made from the red/black plastic material and aluminum backing, and the upper-edge of the resonator was chiseled-out to accommodate them. 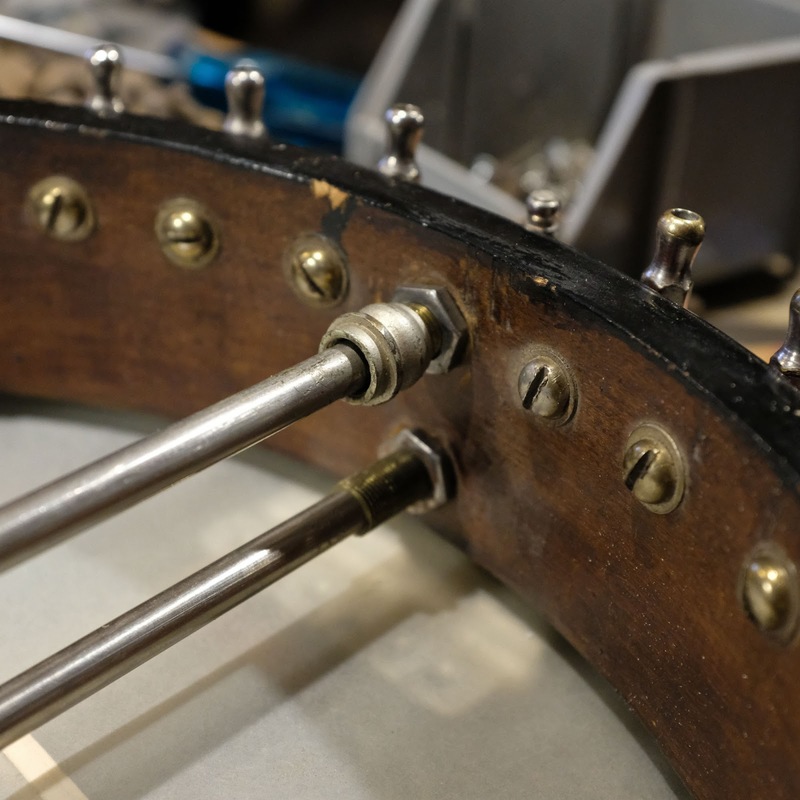 It's weird because much of the instrument is made from period parts, but there's a whole section of it that smacks of '60s or '70s monkey-wrenching. My own work was pretty long and arduous to get this playing up-to-snuff. 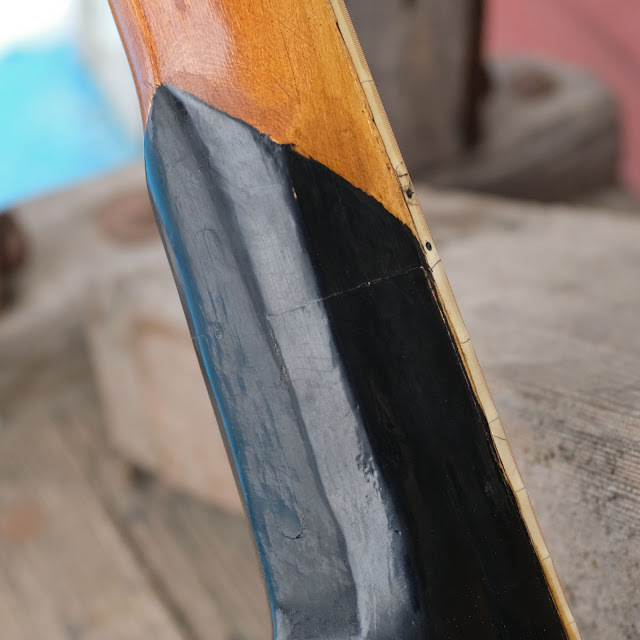 I needed to ameliorate a warp in the neck and that meant pulling the original frets, refretting with taller, thicker stock, and then leveling/dressing those down to a flat plane. 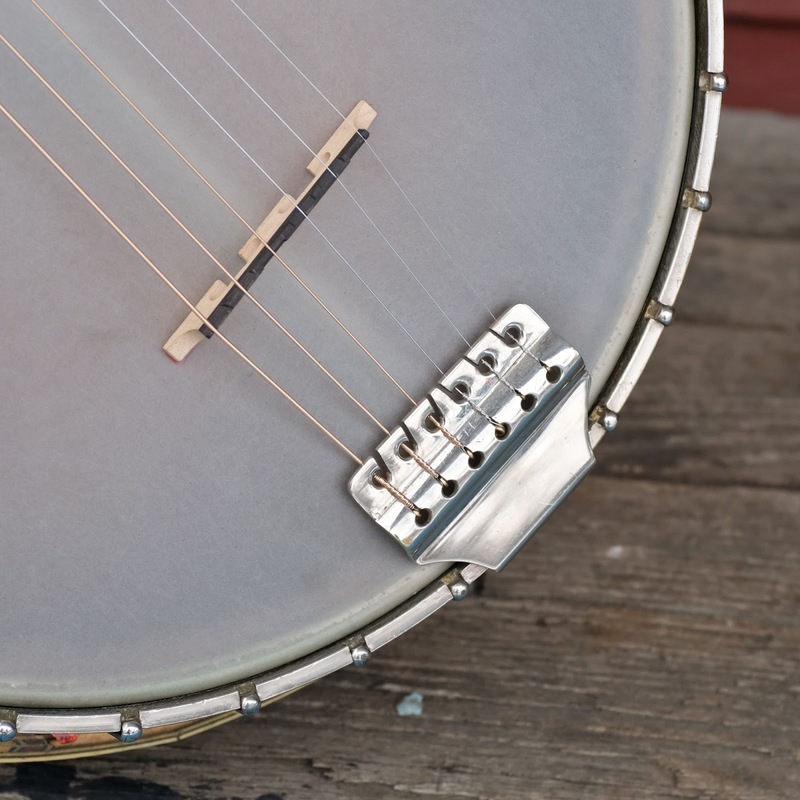 This is because you otherwise lose the cool pearloid veneer on the (maple) fretboard. After that I needed to re-head the rim with a new synthetic one (the original skin head was uncomfortably-unstable) and that meant disassembling the rim which was quite a task because the whole "design" of the retrofit was off-kilter. It took me an hour-plus each side to yank off all the hardware and put it back on in an acceptable fashion. After that, it was pretty basic -- I made a compensated bridge, strung it up, and set it up. 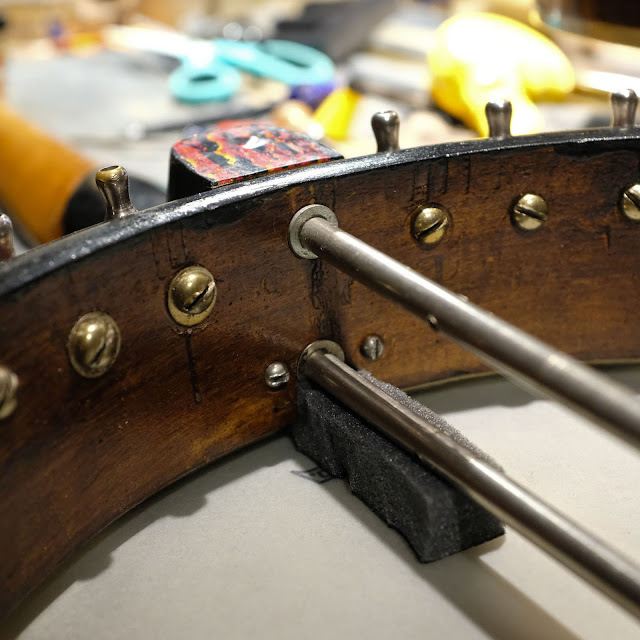 The coordinator rod system made it easy-enough to adjust the neck angle (I had just barely enough thread to adjust it) to suit a 1/2" bridge without having to shim-up the neck joint more than it already was. It's now playing spot-on with 3/32" EA and 1/16" DGBE action at the 12th fret. I've got it strung with "electric guitar" gauges -- 46w, 36w, 26w, 17, 13, 10 low to high -- which is a perfect match for guitar-banjos. Regular "acoustic" strings are too heavy and give a woofy tone. 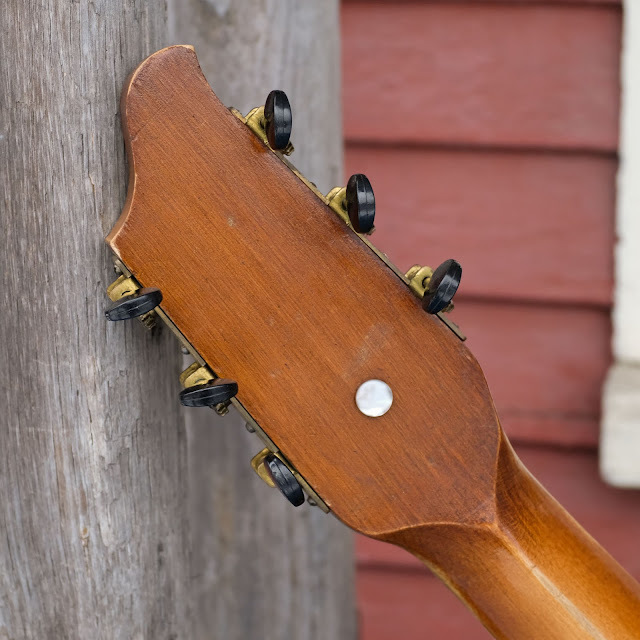 The only downside is that one has to make sure that the G-string slot at the saddle is compensated for the unwound string. From a few feet back, this spectacle of plastic-on-plastic is pretty nifty. 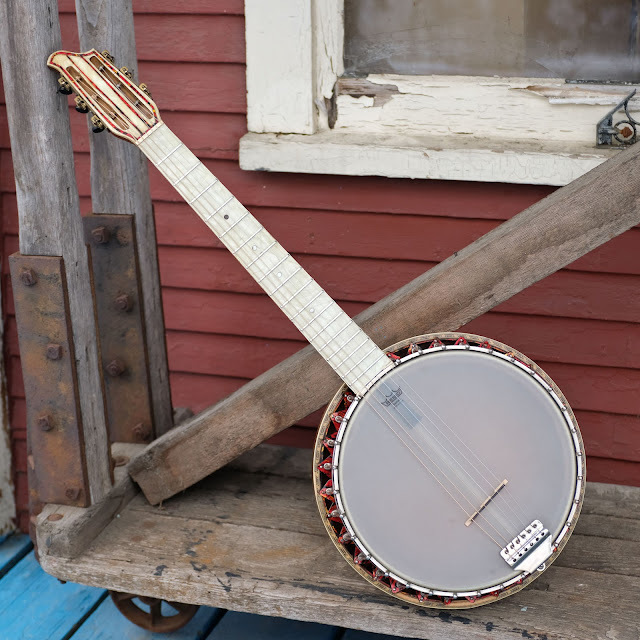 It gets a little grittier up close, but just imagine the red against the cream celluloid under stage lights! The bone nut is original and 1 3/4" in width. 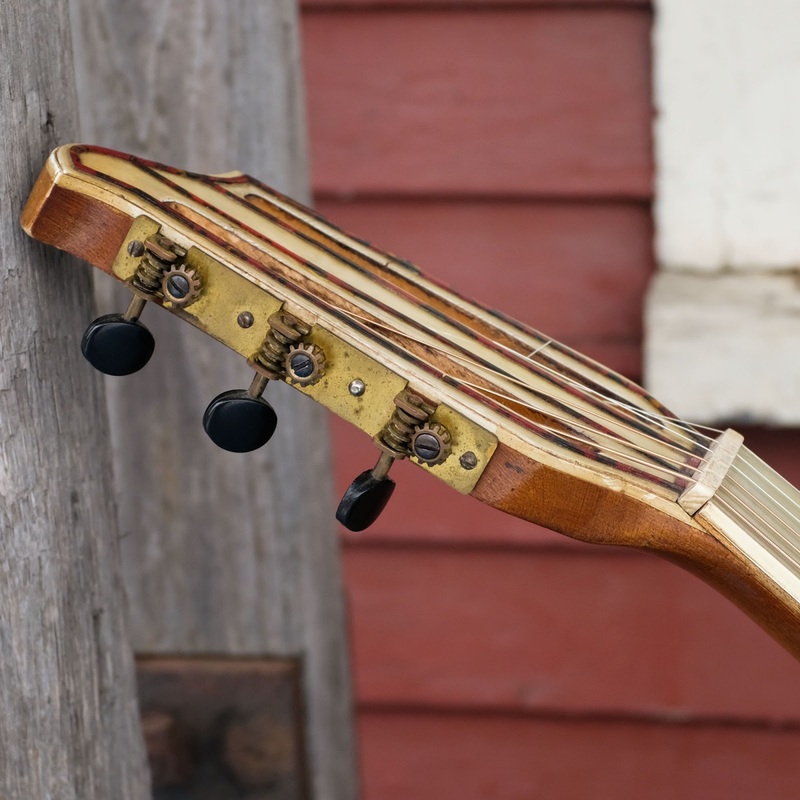 Like you'd expect of this period Kay/SV neck, it has a flat-profile board and a big, honking soft V-shape to the rear. This has the short, 24 3/8" scale that I'm familiar with on other Kay/SV parlor necks from the time. I added side dots while I was at it. 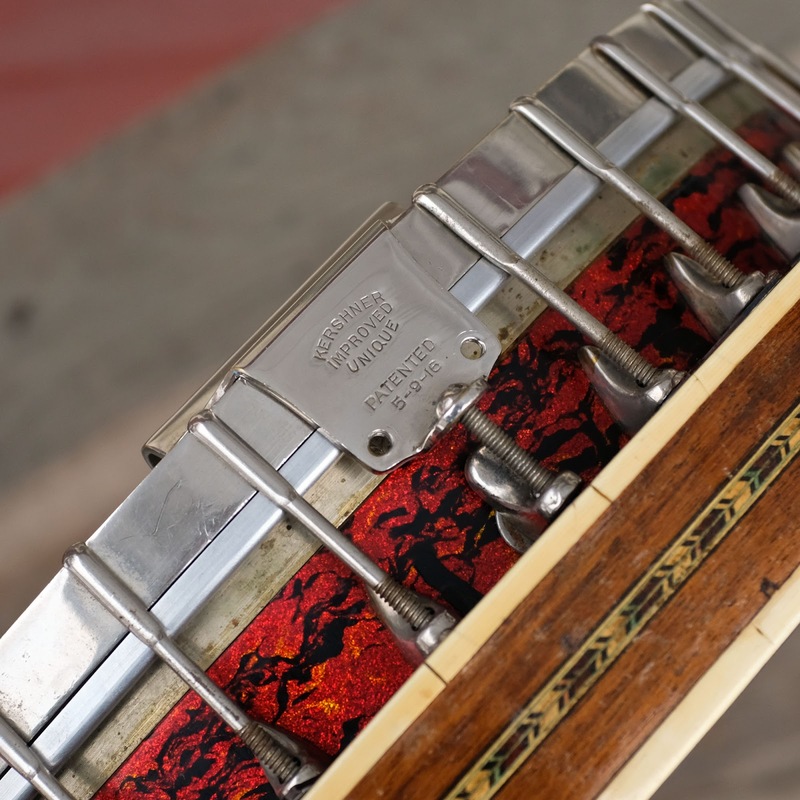 If you look closely you can see that the jumbo frets are filed-down a lot more near the nut and at the joint than they are in the middle. 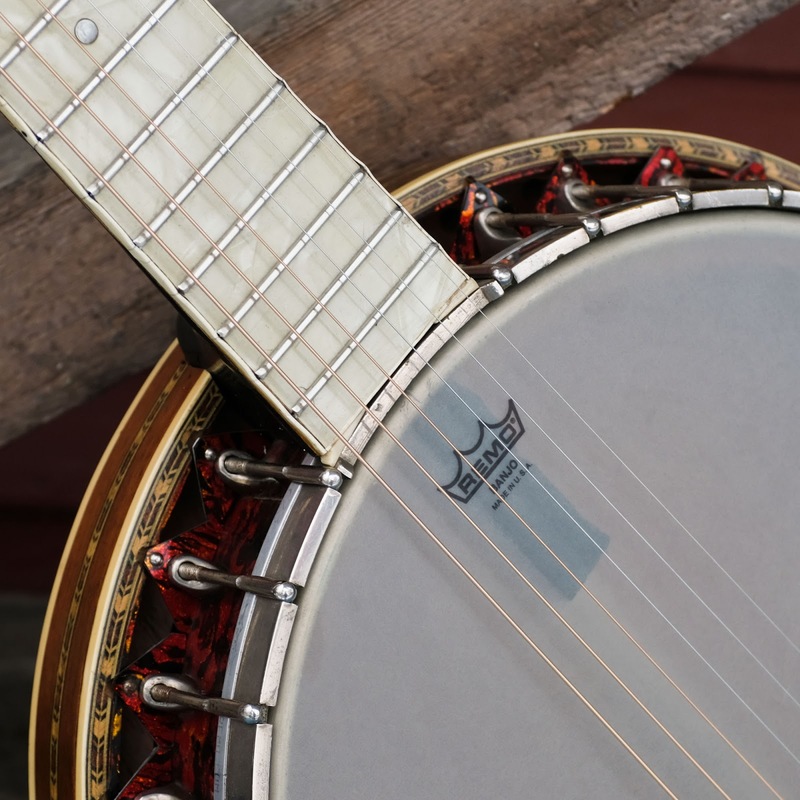 Still -- the result is a "flat plane" at the top of the frets that keeps the neck straight for all intents and purposes in regards to setup. 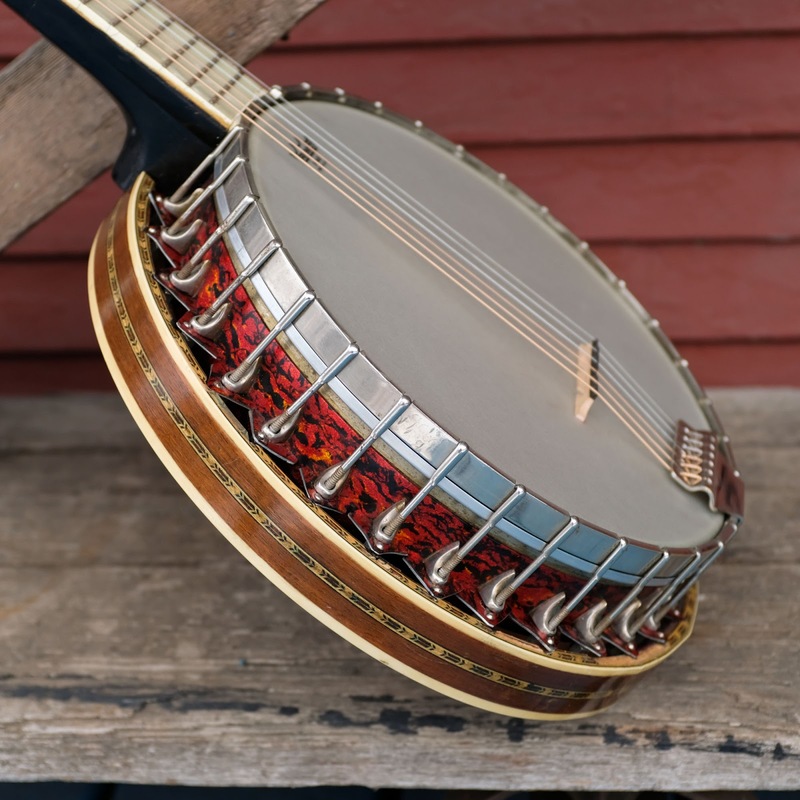 The '20s-period tailpiece is amazing. 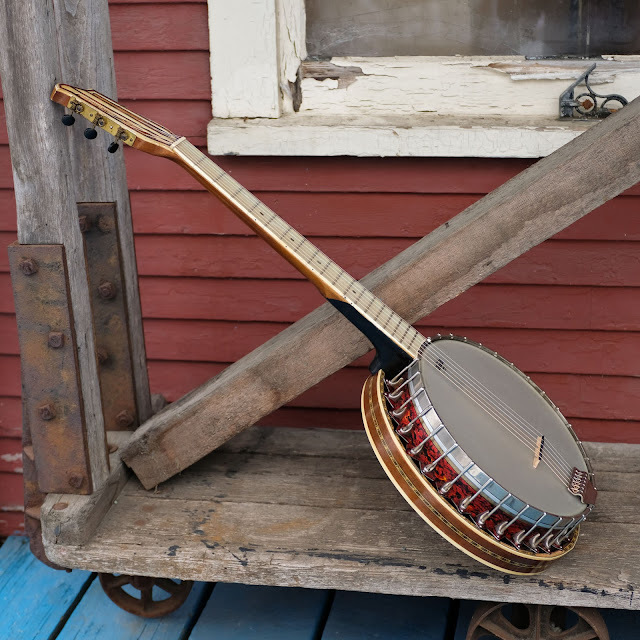 I also usually have a policy to use a heavier-duty bridge on guitar-banjos, but when I used a rosewood, flatback-mandolin-style one, I wasn't happy with the muddier tone I was getting, so went to a lightweight one instead. 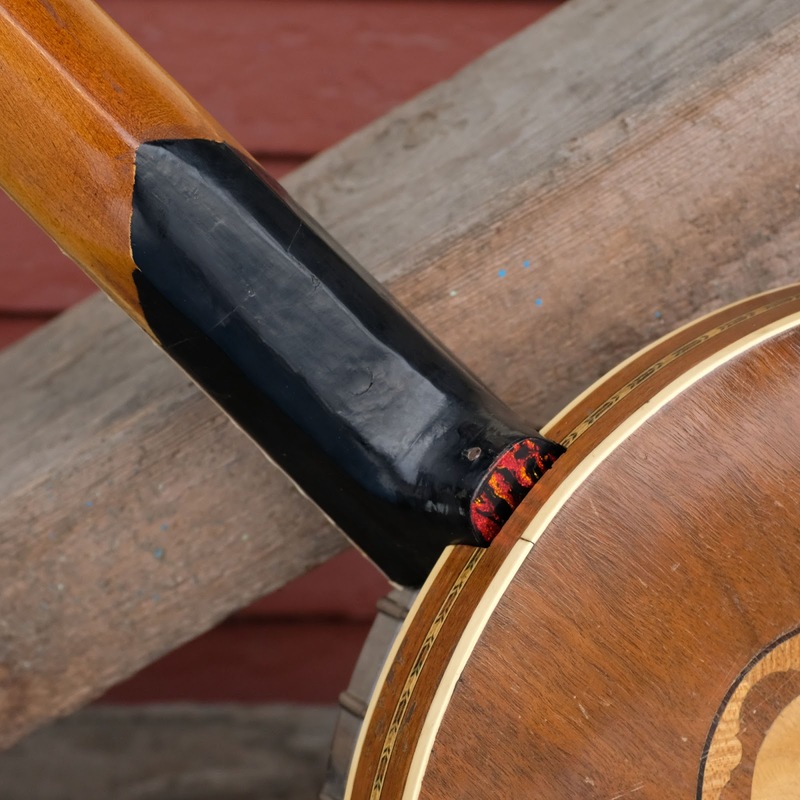 You can see how that red/fire-ish plastic stuff was stuck all over the rim's outside edge and "flange" plates, too. 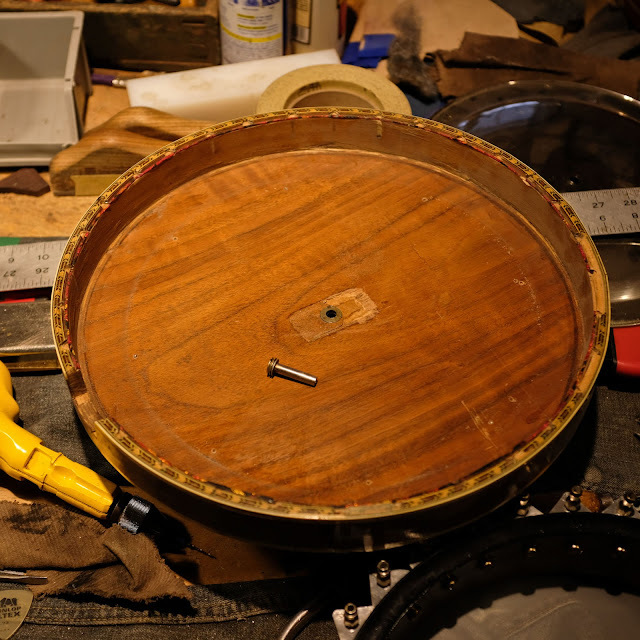 Deep inside I was crying-out to rip all the stuff off and expose the mahogany rim. 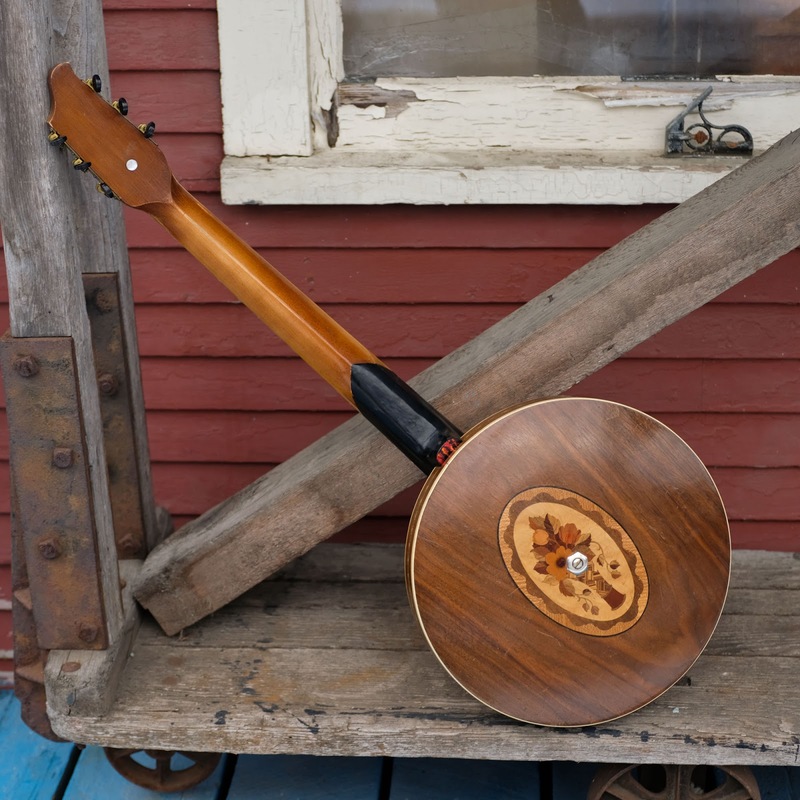 The resonator is a wide 14" across to suit the 11 7/8" rim. 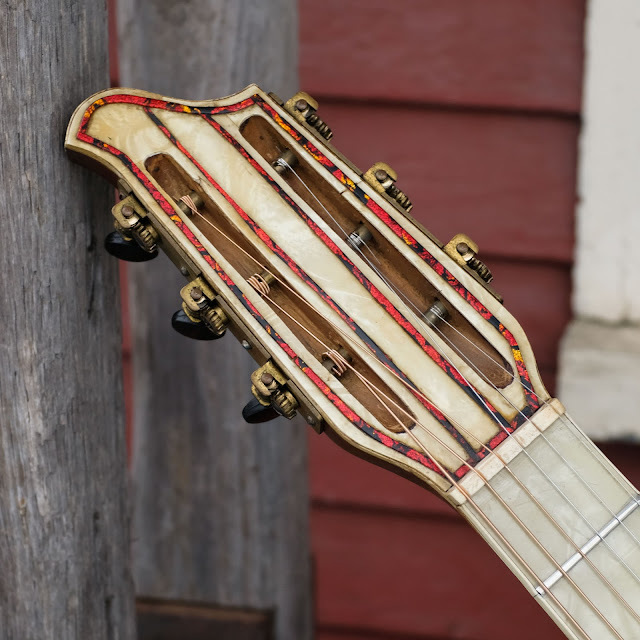 Here you can see the mated neck joint -- note how the original neck terminates right at the 12th fret -- where it would've joined a guitar body. Under the hood you can see the two coordinator rods. They're a bit misaligned but they do their jobs. The foam damps overtones which -- due to the rim size and string count -- are considerable without it. 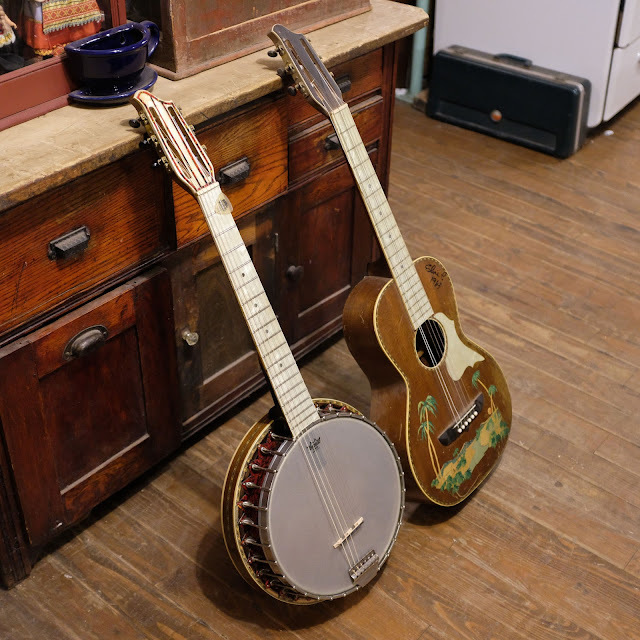 This originally came-in with another '20s-era "pie plate" aftermarket Elton resonator attached to the wood resonator you see. I didn't understand why it was installed on this (it didn't look original) as it didn't add any nice sonic-deflection characteristics at all and just added weight. So -- I took it off and stowed it with the instrument's case. 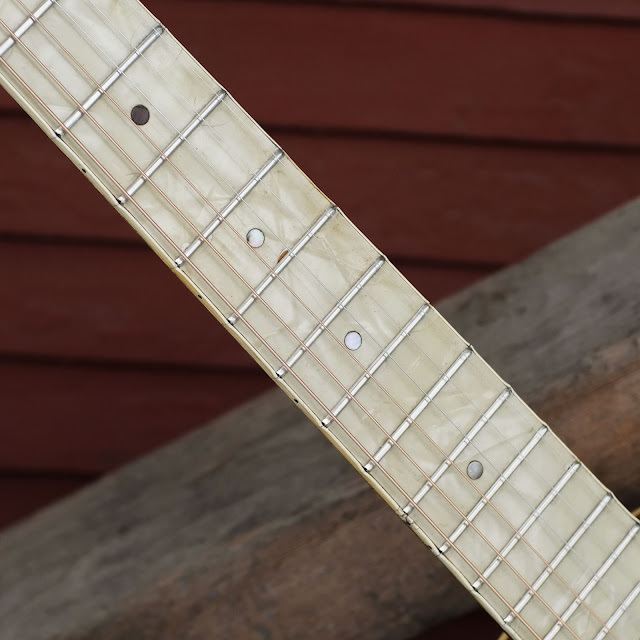 Here's the type of guitar this neck would've originally come from.